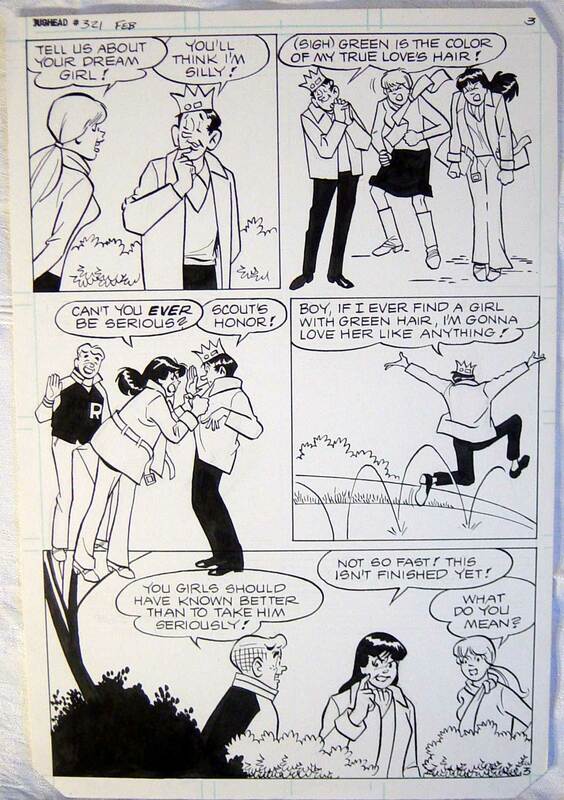 Here’s another selection from our stash of original comic art. It’s a complete short story from Jughead #321, with art by Samm Schwartz. My apologies in advance for the quality of the images; they were shot with an older digital camera under conditions that I ought to have controlled more carefully than I did. 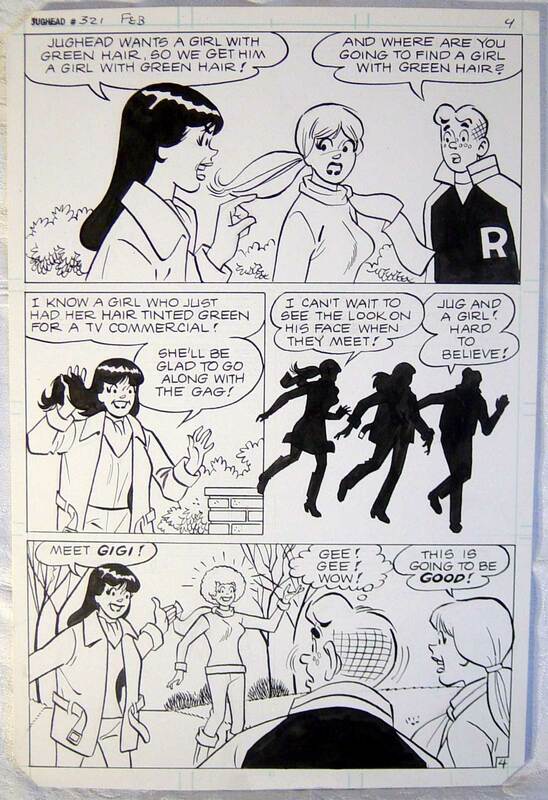 When I was a youngster, my favourite “Archie” artists — even before I knew their names — were Samm Schwartz and Harry Lucey. 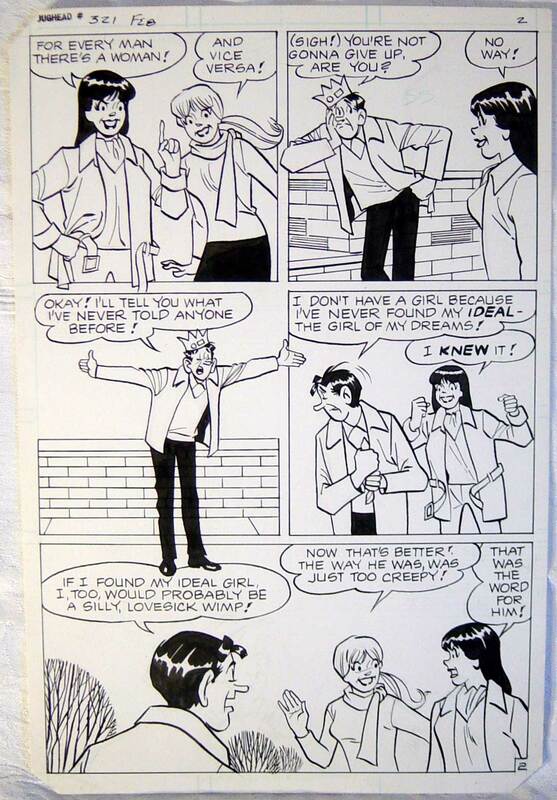 In a corner of the comics world dominated by lacklustre DeCarlo clones, Schwartz and Lucey each took the seemingly inflexible “Archie” house style and made it his own. Schwartz’s work was cool, crisp, refined; Lucey’s, affable, energetic, theatrical. 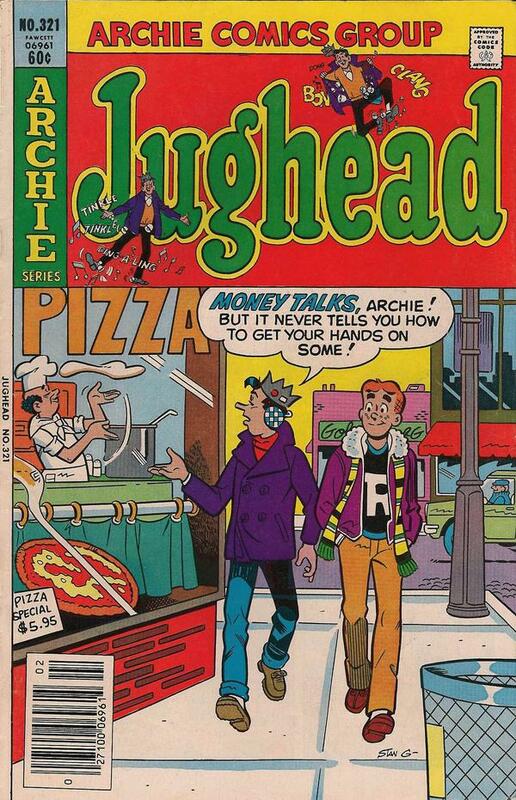 Jughead was never so self-assured, so unflappable, as when Schwartz brought him to life; Archie and the gang, never so determined, or so frazzled, as when Lucey fed them through the wringer. 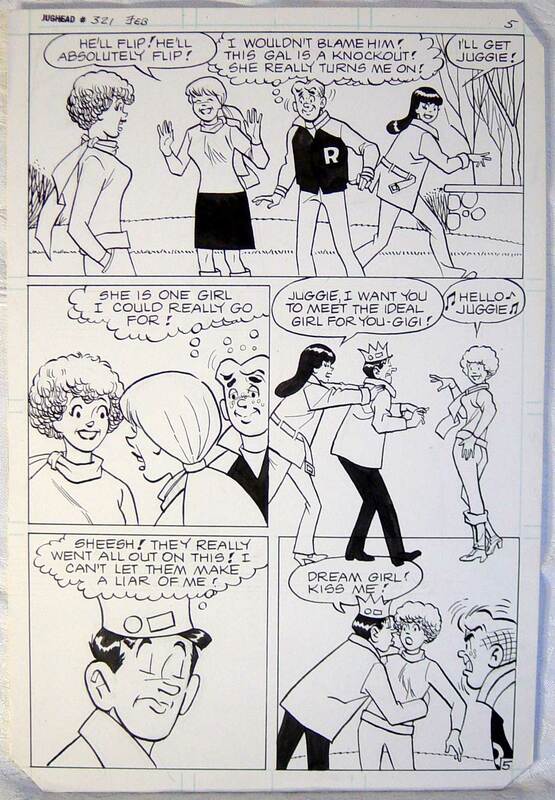 With Dan DeCarlo already in the Eisner Hall of Fame, and Bob Montana, the co-creator of Archie who drew the Riverdale gang for more than 30 years, named to the Hall of Fame for 2010, can Samm Schwartz and Harry Lucey be far behind? In my humble opinion, whether it happens sooner or later, it’s inevitable. “It’s the Chicago South Side Choir Society! It’s their annual uplift cruise for Meditation Week!” — includes scans of “The Bad Old Days” and “In Search of Sanity,” both drawn by Samm Schwartz. A Closer Look at Samm Schwartz — includes a scan of the story “Crowning Glory,” with art by you-know-who. A Loan and Blue — from 1963, with unusually hyper-kinetic art by Samm Schwartz; in later years, Schwartz’s Jughead never got out of control like this! It’s like watching Bugs Bunny melt down. Little Archie by Samm Schwartz — wow! 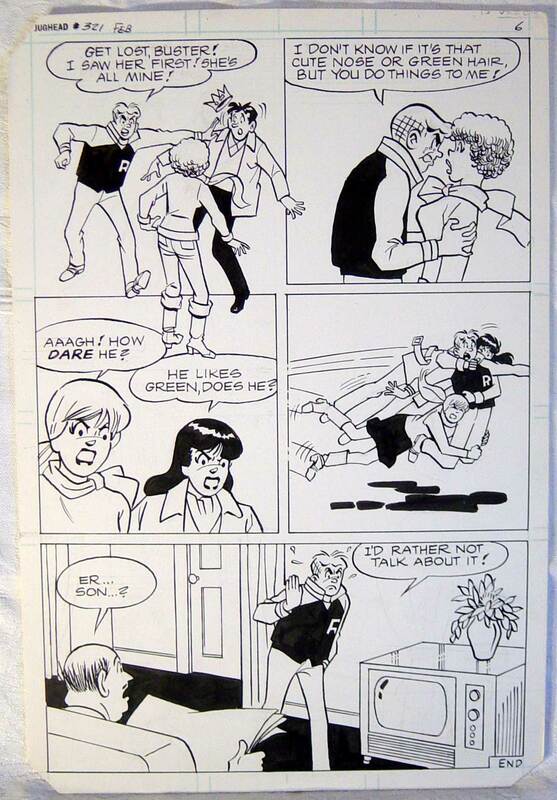 Tippy Teen: “Sure Cure Go-Go” — with art by Samm Schwartz. Very cool & thank you for sharing. Did you inquire about prices, Steed? Yes, I am still selling my father’s artwork. In fact, there is an auction ongoing on Ebay right now. His complete stories have sold for $125-$200 on Ebay and the Antiques Roadshow. I am happy to sell them directly to buyers for less, since I don’t incur commissions. I have a few covers, which have been selling for $700-$900. Thanks for looking up that information, Steed. 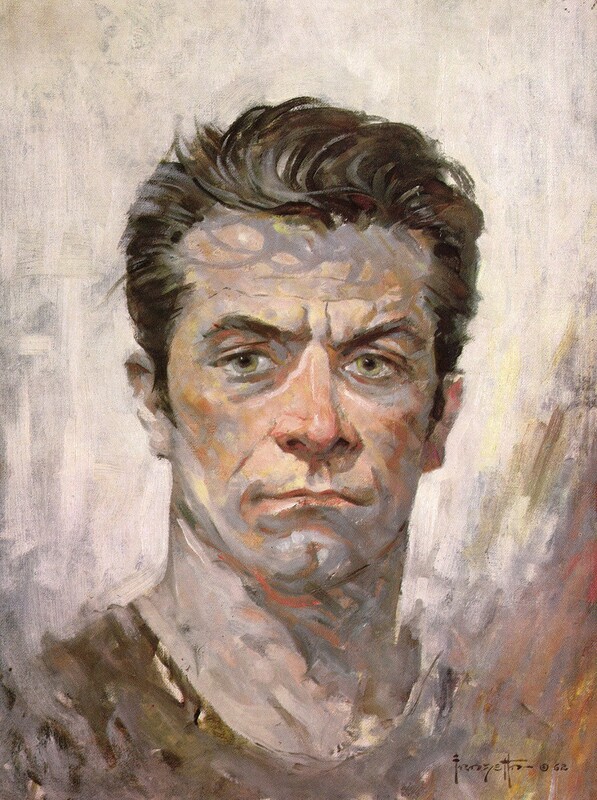 I would love to own more work by Samm Schwartz, but I’m not sure I can justify the expense. Also, I don’t like contacting people to inquire if they have pages to sell. I never know what to say. And I had one really bad experience where I asked a guy what he wanted for a particular sketchbook drawing, he asked me what I wanted to pay, I made an offer, and he got really angry because my offer, apparently, was nowhere near what he thought the drawing was worth.